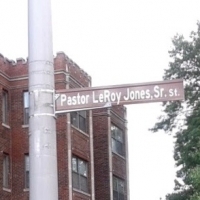 Bishop Leroy Jones, Sr. was honored with his own street earlier this month. On July 16, 2016, Mayor Eric Kellog unveiled Pastor Leroy Jones Sr., Street to honor Pastor's many years of life changing work in the community. Congratualtions Pastor Jones! May the Lord continue to use you as a guiding light in the community.